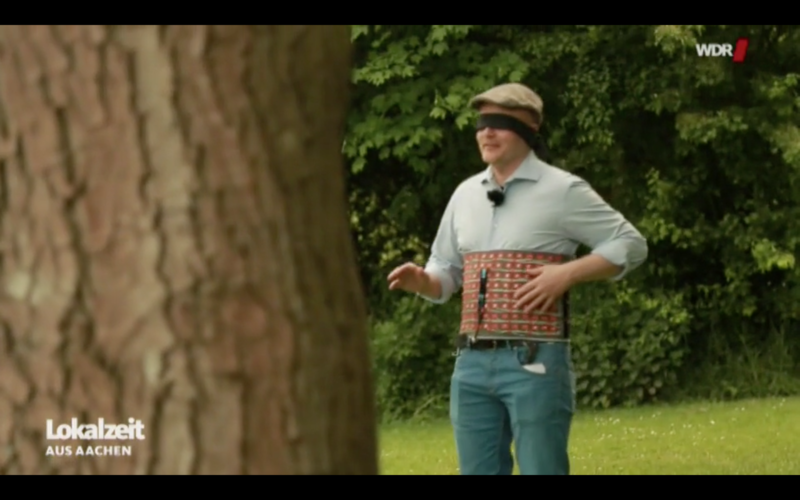 Informationstour "Erfahrbares Lernen" on TV: Our TABULA research project has been selected as one of four flagship projects in the Tangible Learning Initiative of the German Ministry of Science and Education (BMBF). TABULA uses an original invention of our chair — graspable, physical "tangibles" that are tracked by a large, modern capacitive touch table display — to help student teams learn fundamental computer science concepts more easily together. 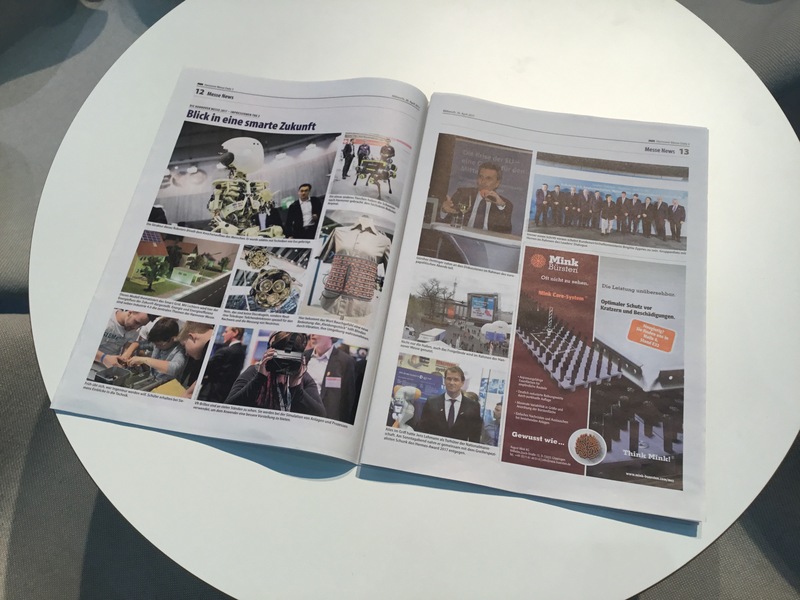 The BMBF has organized a roadshow that travelled to Munich, Bremen, Leipzig and also to Aachen. "FLApp" für die etwas andere Stadttour, Aachener Zeitung, May 9, 2017, in German. (Local cached copy). Projekt Tabula: Es geht los!, e-zine Nr. 179, Elektor Media, June 17, 2016. 3D-Druck Marke Eigenbau, login Magazine, regio iT GmbH, Summer 2014, pp.24–25. Alles aus dem Drucker, interview and report on the future of 3D printing, nano science magazine, 3SAT national TV, Tuesday, August 20, 2013 (in German). 3D Printing Food, part of a report on the future of food, Weck Up Magazine, SAT.1 national TV channel, Sunday, Apr 14, 2013, 8am (in German). Our food printer in action. Gestensteuerung: Mit einem Wink ist alles weg, WirtschaftsWoche Online, March 13 2013 (in German). Die Madonna und ihr Aachener Klon, Aachener Zeitung, February 23 2013 (in German). Schüler auf der Suche nach dunkler Materie, Aachener Nachrichten, Eschweiler, p. 17, July 21, 2011 (in German). Also see our Arduino workshop presentation. Der Computer gibt den Takt vor: Die Software "Saltate" hilft tanzen lernen, nano Wissenschaftsmagazin, 3sat TV, April 29, 2011 (in German) (MPEG-4 video). Kurven statt Kanten Wissenschaftler entwickeln Schreibtisch der Zukunft (in German), Dec 3, 2010. Forscher entwickeln den Schreibtisch der Zukunft (in German), covering our BendDesk multi-surface workstation, Handelsblatt Online, Dec 1, 2010. "Die RWTH ist auf der EXPO 2010 in Shanghai vertreten (...)"
Germany's Federal President Horst Köhler and his wife visited the German-Chinese House at EXPO 2010 in Shanghai today, and played the Silhouettes city building game with a group of German school children. After playing the game, Köhler stopped by the exhibition area in the German-Chinese House to see the city block he created with his group, and to discuss the ideas behind Silhouettes with Prof. Russell and Prof. Borchers. 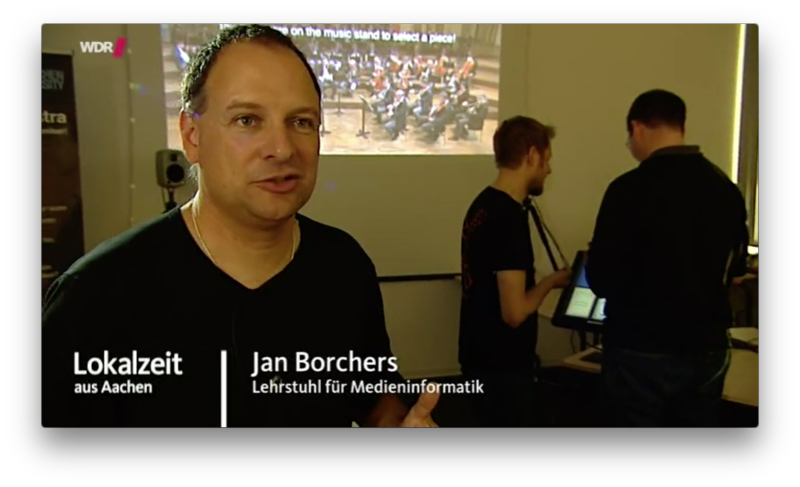 The interactive experience was developed by Prof. Peter Russell's Chair for CAAD and Prof. Jan Borchers' Chair for Media Computing at RWTH Aachen University. Located inside a unique bamboo structure, Silhouettes lets visitors create their own city block using body gestures. Reminiscent of traditional Chinese shadowplay, each group of 16 visitors can use their digital body shadows to create buildings, trees, power lines and water pipes on a 15-meter video wall. By letting visitors create a digital neighborhood on their own, the game is taking up the EXPO 2010 theme of urban development. 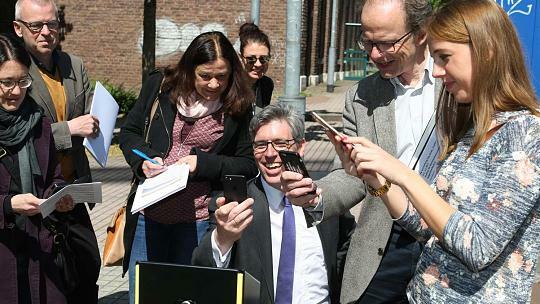 The resulting city block of each group, together with a group photo, is made available online as part of a growing 3D virtual city. The game runs on Apple hardware under Mac OS X. It was developed for the "Germany and China - Moving Ahead Together" initiative of both governments, and is the center of their German-Chinese House at EXPO that will be open until June 25, 2010. A two-player version of the system is installed at the Media Computing Group at RWTH. 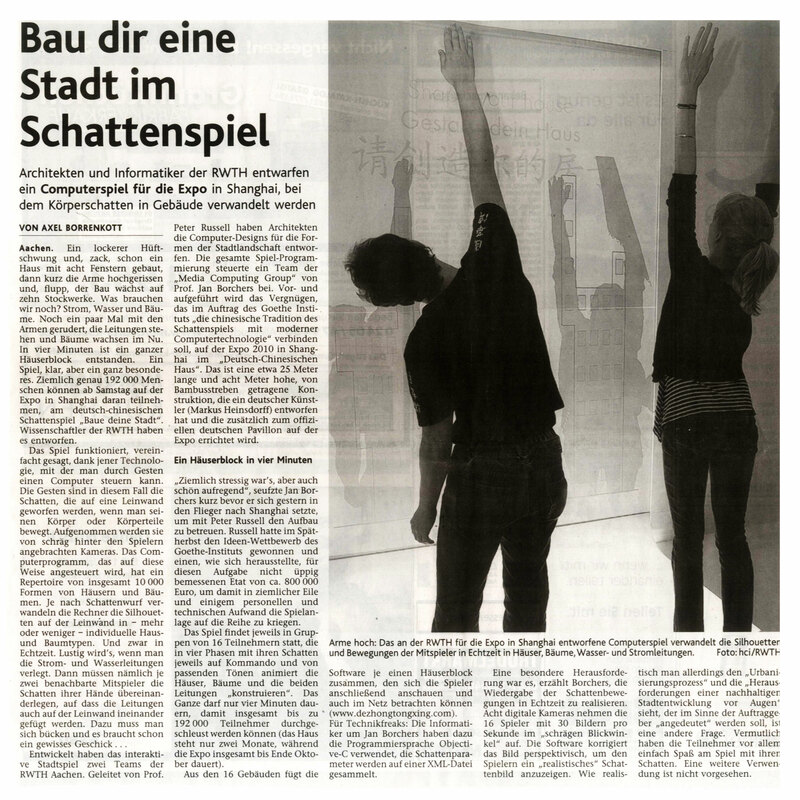 General information (including link to DPA photo of Köhler playing Silhouettes): http://hci.rwth-aachen.de/expo. The growing Silhouettes virtual city online (Köhler's city block is #3545): http://expo.arch.rwth-aachen.de/. Yvonne Jansen receives CHI 2010 Student Research Competition Award: Yvonne Jansen, Diploma student at Prof. Jan Borchers' Media Computing Group, a B-IT endowed Chair at RWTH Aachen University, won the 2nd place in the Undergraduate Student Research Competition at ACM CHI 2010 today. Three undergraduate and three graduate (PhD) students received awards after a three-phase selection process from a total of 56 submissions. As a result, Yvonne received a medal and a monetary prize from ACM. Yvonne received the award for her work on Mudpad, a new technique to bring localized, active haptic feedback to multitouch tables and similar surfaces using magnetorheological fluid. Just for the competition, Yvonne created a small "travel" version of her table-size system, using the prototyping facilities at the group's Fab Lab. After Gero Herkenrath in 2008 and Marcus Reul in 2009, this is the third year in series for the Media Computing Group to bring home an award in this competition. CHI is the premier international conference in Human-Computer Interaction, organized by the Association for Computing Machinery (ACM), with a below-25% acceptance rate. The Media Computing Group conducts research in Human-Computer Interaction, and continues to be Germany's most successful research group in terms of archival publications at CHI (Apr 15, 2010). Haus der Musik: Neuer "Virtueller Dirigent"
Fernsehbericht über die Eröffnung unseres Fab Labs. Tactile Motion Instructions, Hörfunkregionalnachrichten aus Aachen und der Euregio, Sep 3, 2009, 16:31 & 17:31. Im Rahmen der SchülerUniversität Informatik 2009 brachten wir Oberstufenschülern und -schülerinnen das Forschungsgebiet der Mensch-Computer Interaktion näher. TypeRight: Tastatur ohne Tippfehler, WDR Lokalzeit kompakt, Aug 11, 2009, 19:30. 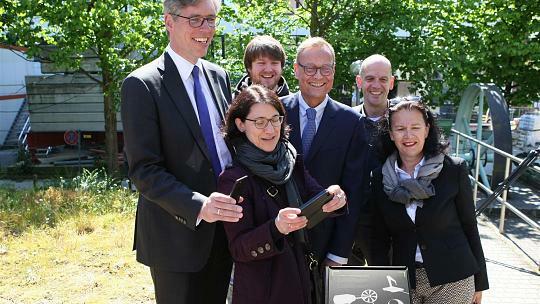 An online article by the Spanish branch of the "Deutsche Welle" about our flexible eBook reader TWEND. 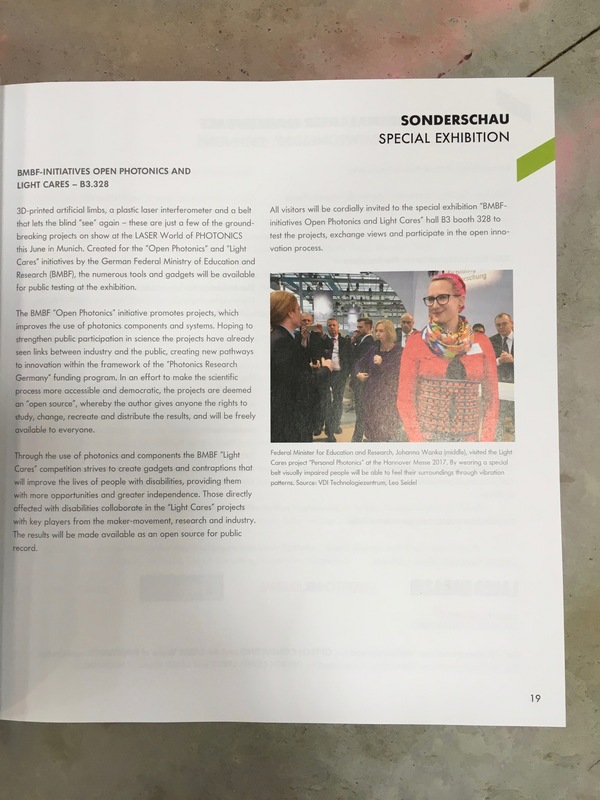 TWEND ist eines der Exponate auf der "MS Wissenschaft". SLAP Widgets add movable, tactile controls to your surface computer, (note from EnGadget). Slap Widgets Bring Physical Controls To Multitouch, (note from Gizmodo). Marcus Reul, Diploma thesis student at the Media Computing Group, won 3rd place in Undergraduate Student Research Competition at CHI 2009 with his work on "Bringing Usability to Industrial Control Systems". 3 undergrad and 3 grad students were selected from a total of 93 submissions. Marcus receives a monetary prize from ACM, and will move on to the ACM Grand Finals in 2010. 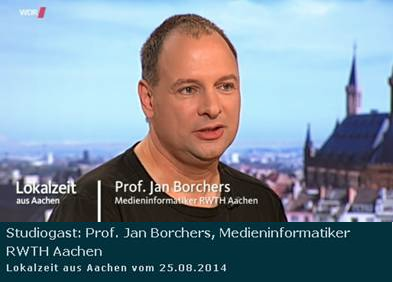 Publisher: Pressestelle der RWTH Aachen. … covers the upcoming launch of Aixplorer (working title). Aixplorer, part of the Route Charlemange project, is an interactive audio/video tour guide that will present information about interesting places according to the user's location, starting with the Aachen City Hall (Rathaus). 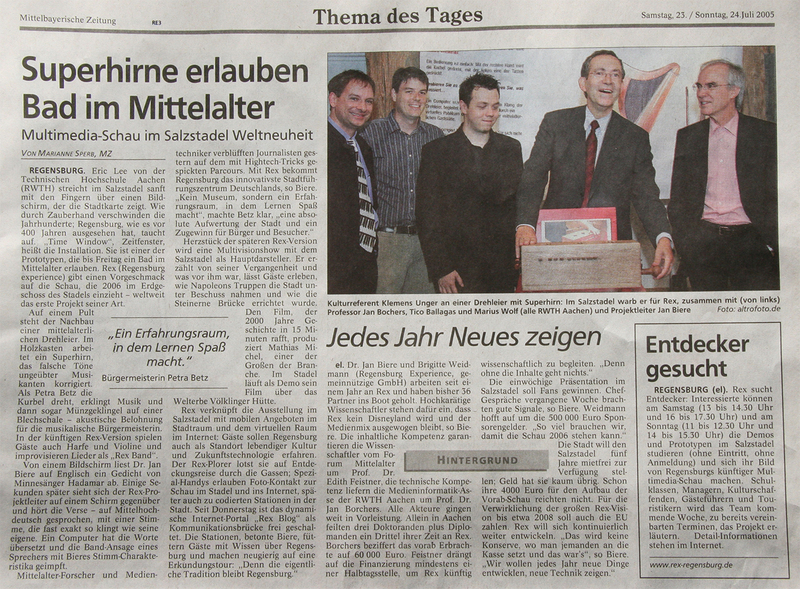 Elitärer Platz im Internet: RWTH Aachen bietet Vorlesungen über Webplattform iTunes an, Aachener Zeitung, Jan 15, 2009, p. 3. 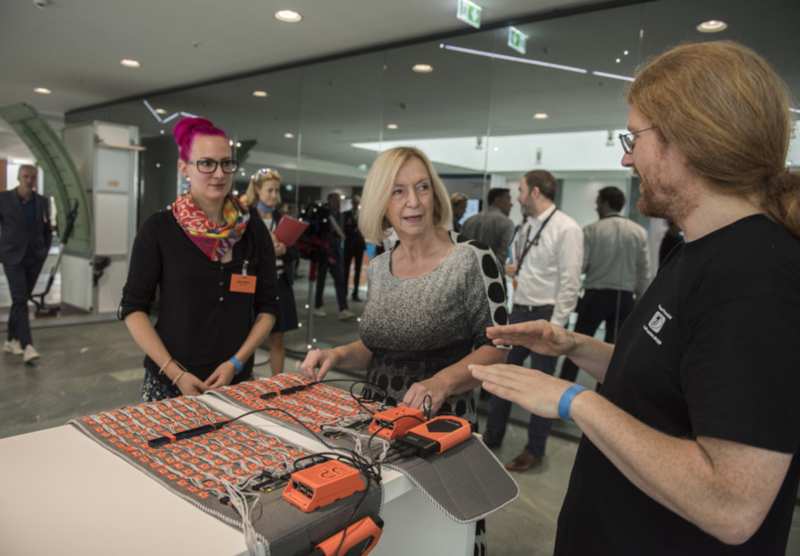 On June 20, Professor Borchers gave an introduction to usable technology, and presented the Personal Orchestra as an example, for around 1,000 children between 7 and 11 years, in the Audimax main auditorium of RWTH Aachen University. The event was part of the Kids' University Kinderuni initiative. ... covers House of Music in Vienna and our Personal Orchestra exhibit The Virtual Conductor. ... covers the demo of Personal Orchestra at the Beethovenfest in Bonn. ... covers the preview exhibitions for Bauhaus Europa in Aachen. Publisher: Beethovenfest Bonn. The article is also online. Publisher: Aachener Nachrichten. The article is also online. ... covers the demo of Personal Orchestra at Tag Der Informatik in Münster. Publisher: Westfälische Nachrichten. The article is also online. Publisher: Münstersche Zeitung. The article is also online. ... covers the `It's Artastic!' 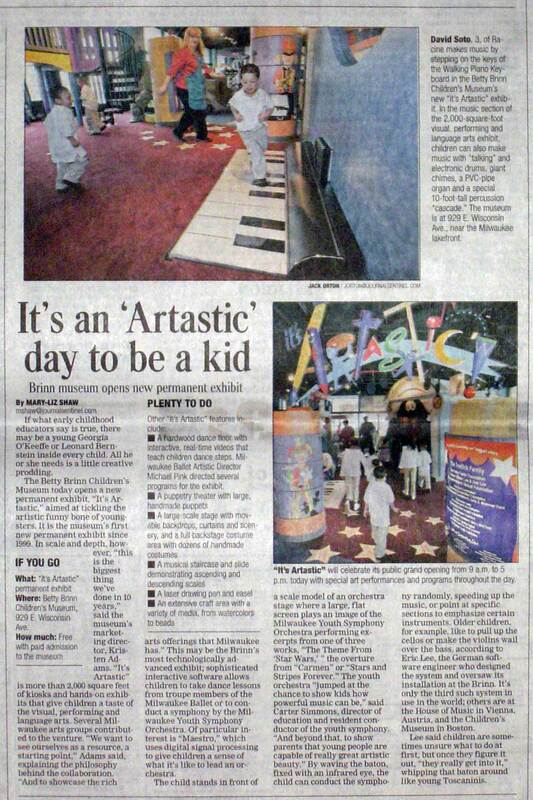 exhibit opening at the Betty Brinn Children's Museum in Milwaukee, Wisconsin, USA, which includes Maestro! a.k.a. Personal Orchestra 3. Publisher: Milwaukee Journal Sentinel. The article is also online. The professional audio magazine MIX talks about our student project Bangarama in their online report from the NIME 2005 conference (halfway down the article). Publisher: MIX (magazine for the professional recording and sound production technology industry). 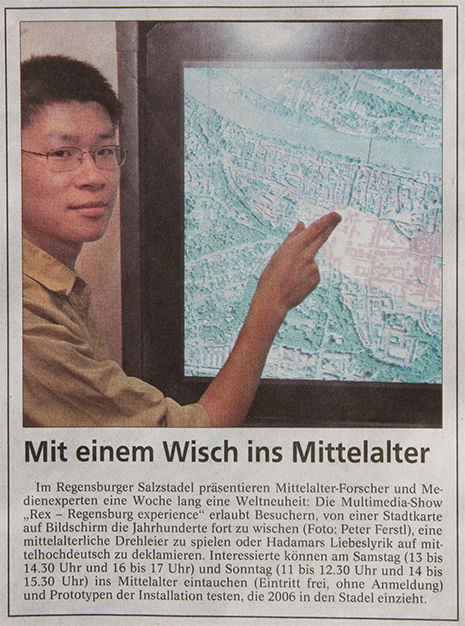 ... contains more information on the REX interactive exhibits preview in the Salzstadl in Regensburg. Publisher: Mittelbayerische Zeitung. The online version of the articles on the newspaper website is missing the full pictures. ... contains short descriptions of personal orchestra, worldbeat and virtual vienna as well as a brief introduction to the media space. Publisher: Technik im Klartext Newsletter 2/2004 (Hochschulradio Aachen). ... contains short descriptions of personal orchestra and worldbeat. Publisher: RWTHinsight 4/2003 (RWTH press office).